Pupils from Buckie’s Cluny Primary came up with the name ‘Selkie’, a mythical Scottish creature that resembles a seal in the water but assumes human form on land. 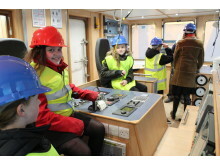 Schools from all the coastal communities in Moray were encouraged to entre to the competition, and last week received their runner-up prizes. 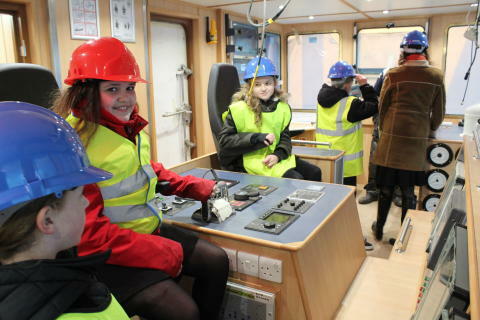 But yesterday- in addition to their prizes of books, the Cluny youngsters were given an exclusive preview of the 90ft vessel by Buckie-based Macduff Shipyards. 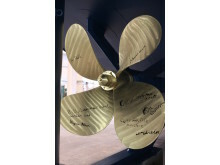 As part of their tour they all signed their names on the dredger’s giant propeller blades with long-lasting ink pens. 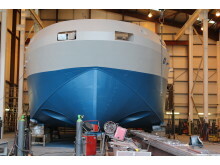 The 250 tonne dredger is a replacement for the council’s former vessel, the Shearwater. That was decommissioned and sold as scrap two years ago. 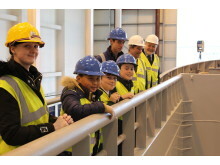 Moray Councillors agreed to fund the replacement just prior to that, and the contract was secured by Macduff Design and Shipbuilding after a competitive tender. 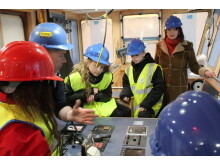 Class teacher, Shona Cowie, said the youngsters learned a lot about the ship. "They were delighted when the name they chose was selected," she said. "All the class had been studying Scottish mythical creatures, and the name Selkie seemed to be right for the new ship built in their town. "We all think the ship's awfae bonnie." 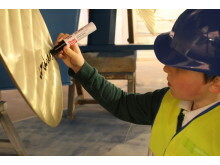 After their tour, the youngsters all signed their names on the ships huge propellers with a waterproof marker. The dredger still has to be floated and taken through a series of sea trials before she is formally handed over to the council. This will happen on Friday May 6 at a naming ceremony in Buckie harbour, when the Lord Lieutenant of Banffshire, Mrs Clare Russell, will name the ship in the traditional fashion by breaking a bottle of champagne over her bow. Cerys Coull; Billy Summerfield; Ceira Cameron; Freya Skene; Alyssa Allen; Paige Mackie; Ryan Ritchie; Lauchlan Stewart; Charlie Moonie; Gordon Cuo; Autumn Taylor. Male selkies are described as being very handsome in their human form, and having great seductive powers over human women. They typically seek those who are dissatisfied with their lives, such as married women waiting for their fishermen husbands. If a woman wishes to make contact with a selkie male, she must shed seven tears into the sea. If a man steals a female selkie's skin she is in his power and is forced to become his wife. Female selkies are said to make excellent wives, but because their true home is the sea, they will often be seen gazing longingly at the ocean. If she finds her skin she will immediately return to her true home, and sometimes to her selkie husband, in the sea. Sometimes, a selkie maiden is taken as a wife by a human man and she has several children by him. In these stories, it is one of her children who discovers her sealskin (often unwitting of its significance) and she soon returns to the sea. The selkie woman usually avoids seeing her human husband again but is sometimes shown visiting her children and playing with them in the waves.